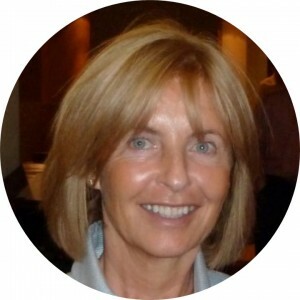 Michele Breene is an executive coach for leaders in ministries, non-profits, foundations, and Fortune 500 companies in the US, UK and around the world. She also writes curriculum and facilitates for DAI’s Master of Arts in Organizational Leadership and non-formal leadership training. Michele holds an MA in Curriculum Studies (London, UK). Tim Breene served on the World Relief Board from 2010 to 2015 before assuming the role of CEO in 2016. Tim’s business career has spanned nearly 40 years with organizations like McKinsey and Accenture where he was the Chief Strategy and Corporate Development Officer. Tim was also the Founder and Chief Executive of Accenture Interactive. 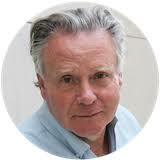 Tim is the co-author of Jumping the S-Curve, published by Harvard Publishing. 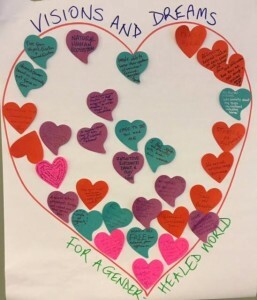 In the wake of the #MeToo campaign and revelations of rampant sexual harassment in our society, Gender Equity and Reconciliation International (GERI) recently convened an invitational gathering outside of Seattle co-sponsored by the Imago Dei Fund, comprised of 33 key leaders from women’s and men’s movements across the country. 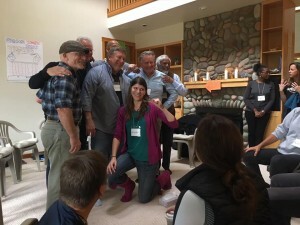 My husband, Tim, and I were delighted to be invited to experience this unique and profound process which aims to foster a deep listening and empathy across the gender line to heal and dismantle the collective gender conditioning which lies at the root of all the #MeToo stories. We had no idea what to expect! This subject matter must be one of the most challenging issues of our day and yet with wisdom and sensitivity, our facilitators, Cynthia Brix and Will Keepin, along with their international team – Zanele Khumalo, Lauri Gaum, John Tsungme Guy and Julien Devereux – led us into a safe and beautiful space of sharing and healing. 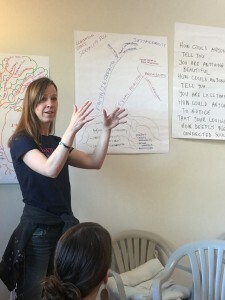 The facilitation team had all completed the professional training program developed by GERI, which conducts intensive trainings for facilitators of their process in several countries including South Africa, India, Kenya, Australia, and the United States. Those attending were a remarkably diverse group in terms of life experience, age, geography and engagement with this issue, yet we shared a common humanity – a sense that we are all made in the image of God – and a determination to address the different ways gender conditioning manifests itself in our lives and in our work: in a harmful imbalance of power that limits the rich complexity of our humanity, putting people in rigid boxes which create needless suffering. We all recognize that gender inequity is deeply embedded in the patriarchal assumptions handed down through generations. It may be obvious or hidden but it is always pernicious and, as we learnt, it is remarkably pervasive. And as we look around the world and listen to #MeToo stories that are just the tip of an ugly iceberg, we see gender wounds only getting worse if we do nothing – especially in the light of growing opportunities to exploit and distort sexuality through the internet. Tim and I were both surprised at the extent to which both men and women carry wounding, from mother to son, father to daughter, etc. Not just through physical and/or emotional abuse, but in the unwitting stereotyping passed on in ways that create enormous pressures on young adults seeking their identity in the world and trying to build their self-esteem. The damage we do to one another as adults often has its roots in our childhood years. We sat as a circle of women and listened attentively to one another as story after story of abuse and more subtle yet still painful experiences of male presumption were shared. The men too sat together and shared their “gender pain” which included a range of experiences from childhood to adult which included abuse and losing parts of themselves in the “man box” of patriarchal conditioning. Women are the primary victims and have suffered in profound and lasting ways, but men too have suffered within the snare of patriarchal norms imposed by their cultures. We shared through silent witnessing, the pain and heartbreak of individuals’ stories and were moved by the opportunity to listen without judgment, to offer deep and genuine compassion, unconditional love and respect for one another. Tim and I were struck by the immense value arising from the sharing by both genders of how we have each been affected. Personally, my heart is still resonating with joy and a growing sense of hope that gender equity might actually become a reality during our daughters’ lives. We laughed, we cried and we bonded around our individual experiences of deep wounding and personal shame, sharing the beginnings of our journey towards reconciliation between our genders. To my mind, the strength of reconciliation that took place could not have happened without the skillful guidance of our leaders, down into the deepest pits of our pain, holding attentively each others’ grief and distress, through to sincere affirmation and shared appreciation for one another. 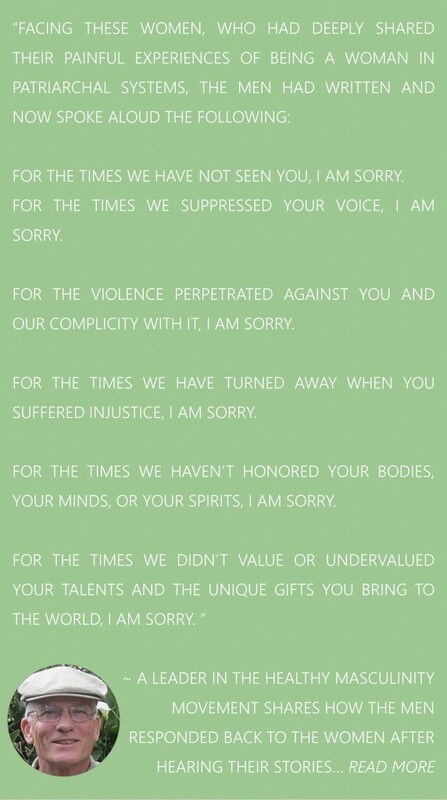 We recognized that we cannot fix anyone’s pain but we witnessed how we can each be a part of one another’s healing. 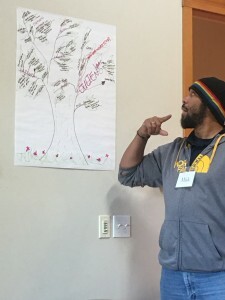 As I experienced this way of healing the underlying roots of harmful gender conditioning, I was reminded of how hard it is to bring deep and lasting change when people have been hurt by one another. I’ve led workshops with Kenyans, Ugandans, Rwandans and South African brothers and sisters, designed to reconcile racial and ethnic differences and tensions. We have spent considerable time in South Africa and almost 25 years after the Truth and Reconciliation Commission and its associated ‘Ubuntu’ ideology, there has been some progress. However, most leaders there would agree there is still a long way to go to heal the wounds left behind by apartheid and achieve reconciliation between black, white and colored communities. Like apartheid or any ideology which treats whole groups as inferior or superior to “others” and sanctions the advantages and right to rule of one group over another, patriarchy has become so deeply rooted in our culture and faith traditions that it can be hard to see and liberate ourselves from. The process that we experienced over the course of four days draws from the “truth and reconciliation” tradition that took place in both South Africa and Rwanda and seeks to apply the same deep listening and forgiveness to name and see and heal. 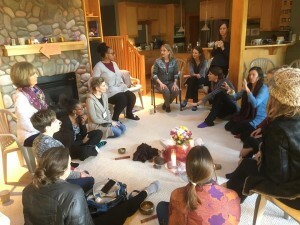 We believe the GERI approach breaks through to a deeper level weaving in contemplative silence and rituals to facilitate a deeper empathy and listening. 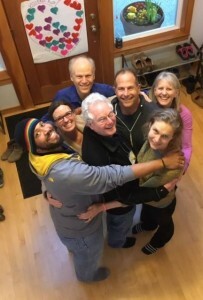 What we experienced together went far beyond truth-telling and forgiveneness, far beyond an intellectual conviction of the need for change to a whole-hearted emotional and instinctive commitment to collaborate with one another in healing together, driven by a powerful and unified rejection of gender conditioning that needlessly creates limiting boxes and injustice. 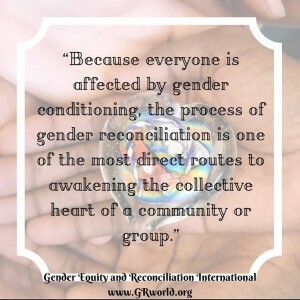 Our experience of this approach to gender reconciliation has left us with an overwhelming conviction that now is the time to fully engage and be a part of ensuring this movement continues to act as a catalyst throughout this country and beyond, gathering momentum and scaling up towards deep and sustained change for our grandchildren. Stay tuned for #WeHealTogetherNewEngland this spring!